It's been 50 years since Eric Burdon joined the Animals. However, even after fronting War and the Eric Burdon Band, not to mention enjoying a long solo career, Burdon has made what might be his most personal album yet. One of Rolling Stone's 100 Greatest Singers breaks down his new album, 'Til Your River Runs Dry, track by track, revealing how he channeled such diverse inspirations as water conservation, Fats Domino and President Barack Obama. 1)"Water" – "Having lived in the arid deserts of Southern California since the 1970s, my interest in water conservation is a very personal concern. Water! The source of life! Some people are squandering the world's most precious resource while others have too little clean water to drink. I sing this song in the hope that I can bring some balance to the issue of water, to bring some attention to the importance of water to our future on the planet." 2)"Memorial Day" – "It is a very important day in the U.S. and the U.K. When I was a child in England, it was observed as a very solemn day. Everyone would wear a red poppy in their lapel. It represented the blood of the fallen. But on Memorial Day, I don't want to only remember the combatants. There were also those who came out of the trenches as writers and poets, who started preaching peace, men and women who have made this world a kinder place to live. So it's the hippies, the poets and the spartans that I will remember on this Memorial Day." 3)"Devil and Jesus" – "This song is about the internal struggle within ourselves. Inside each of us, there is the seed of both good and evil. It's a constant struggle as to which one will win. And one cannot exist without the other." 4)"Wait" – "I wrote this song for my wife. I waited for a long time and finally she came along. I had this Latin love melody in my head and I let the words breathe, like I'm whispering to her, the one I love. This song is for everyone out there who is alone and thinks they'll never find the perfect match. I'm here to tell you that it can happen to you as it happened to me. It is like learning meditation; in this crazy world, everything moves so fast. Stop and wait. Wait for your soul to catch up to you and love will find you"
5)"Old Habits Die Hard" – "The hero emerges from the gas clouds with a red bandana wrapped around his neck and a molotov cocktail in his hand. It's the spirit of youth that has to be acknowledged. It's the need for change that drives us to join forces with our brothers and sisters all around the world – but change is slow. This song is dedicated to the people in Egypt and Libya trying to throw off the shackles of all those centuries of brutality. It reminds me of Paris in 1968 when I saw the kids going up against the brutal police force or the L.A. uprising. I went through these experiences and they're still with me today. The struggle carries on. I wrote this song so I won't forget and to say, even though I'm older now, I am still out there with you." 6)"Bo Diddley Special" – "I use any excuse I can to utilize the Bo Diddley 'bilongo beat.' I just like to be at that particular place that Bo Diddley created, which has its roots in Africa. I was invited to his funeral ceremony and after hero-worshipping the guy for years, I never had the chance to meet him face-to-face, until he was lying in his coffin. As my wife and I stood looking down at Bo, in his state of grace, I was thinking to myself, 'I'll bet he's lying there listening to everything that people are saying about him.' He was so alive. I promised him then and there that I would write a farewell song to him. Bo Diddley was so important but he's been underrated in the world of modern music. Goodbye, Bo Diddley." 7)"In the Ground" – "It has a great gospel feeling to it. It reminds me of images I've seen in places like Jamaica and New Orleans, of funerals conducted by black people for black people, lifting the spirit up to the sky." 8) "27 Forever" – "I wanted to write this song in order to give a warning to all the young artists approaching the age of 27; the song is an observation, it's a warning and it's a very definite phenomena that I was almost a part of. What are we doing in our lives that makes the age of 27 so important? Is it that we realize that there is no more youth and we're now in the world of being responsible adults? Or it's just an astrological event that has to do with Saturn's return. Jimi Hendrix, Jim Morrison, Janis Joplin, Robert Johnson, Kurt Cobain and, recently, Amy Winehouse, to name a few. They all died at the age of 27. But every time I hear their voices, they are alive and well in my heart." 9)"River Is Raising" – "This song is inspired by the story of Fats Domino during Katrina. They were saying that he was missing. Then he rose up from the flood. It was such a great relief to see that he was still alive, the guy that I had hero-worshipped all my life, the sound of New Orleans. I was singing the chorus of this song before thousands of people in Europe and everybody started singing the refrain along with me. I realized that the rivers are rising all over the world. It's a global phenomenon. That's why everybody was singing with me. They all thought I was singing about their own territory. Then, returning to the US, I was pleased to record this song in New Orleans at John Cleary’s studio with some of Fats Domino's band members. We did it in two takes. One rehearsal, one take. To me, it's the greatest piece of music I've been involved with, since the musicians in New Orleans understood where I was going with this song." 10)"Medicine Man" – "I fell in love with this song as soon as I heard it. It's penned by Mark Cohn. I never met the gentleman but this song is more than brilliant. It's a great story, a novel wrapped up in the form of a song." 11)"Invitation to the White House" – "When Obama first came to the White House, like everyone else of 'our way of thinking,' it was a time of joy, a great step forward in American history, to see a black man becoming president of the most powerful country in the world. This was a phenomenon in itself – and the way Obama sold himself and projected himself to his audiences, to me was a kind of an invitation to the White House, to knock on the door, to stop by and see how he's doing and to have a conversation about current state. I thought he was different from any other President – and of course, he is, he's black, he's a brother. My visit with him was just a dream but maybe someday my dream could become a reality." 12)"Before You Accuse Me" – "This song is the wild card of this album. We were in the studio at the end of the recording session and I wanted to leave on a positive note. The message, 'Before you accuse me, take a look at yourself,' is something that everyone should live by. I wanted to pay homage to the wonderful guy who wrote this, to fulfill my promise to him to sing 'more Bo Diddley songs.'" 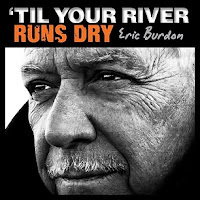 'Til Your River Runs Dry will be released on January 29th.